Remember the first time that you started cooking on your own? 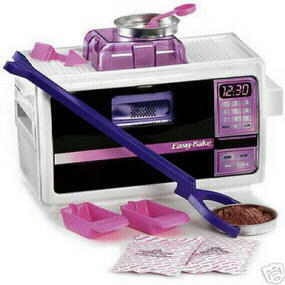 One year for my birthday I begged my mom to get me an Easy Bake Oven. I was so excited when I unwrapped my gifts and found the present I had been hoping for! I delved right into preparing my first Easy Bake Oven creation. It was either a chocolate cake or brownies. I was so excited! I read the directions and mixed all the ingredients together, but there was one problem. The mixture looked too dry so I added more water. Lots of water! I put my tiny little creation in the tiny little slot that is supposed to be an oven, and I waited and waited and waited… I finally took the brownies out of the oven only to find them still not done. I had no clue what I did wrong. That’s when I learned that it’s usually best to follow the directions when baking. We ended up eating the brownies with a spoon. I’ve had many more baking mishaps since that day; like the time I tried to melt carmel and ruined my mom’s pot, making icing that turned out like syrup (still tasted pretty good), sticking a perforated pan in the oven and having burnt cookie dough rain down out of it, lots of boilover incidents, many burnt cinnamon buns, and the list goes on… I guess it’s a good thing I didn’t accept that offer from Johnson and Wales to study to be a pastry chef! I have to admit I’ve come a long way. I’m even getting good at improvising and putting my own spin on recipes.